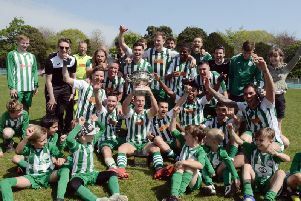 The SCFL Premier division title will be decided on the last day of the season after Haywards Heath Town and Shoreham both won today (Saturday). Goals from Karly Akehurst and Melford Simpson (2) gave Heath a 3-1 win at home to Loxwood, while Tom Burton's solitary goal was enough for Shoreham to beat Pagham. Heath just have to equal or better Shoreham on the last weekend to secure the title. Heath travel to Horsham YM while Shoreham visit Arundel.